The South Korean coast guard has established an emergency rescue headquarter, sending helicopters, ships and special rescue team to search the missing people. The Chinese Consulate General in Busan has also sent a team of four people to assist the rescue work and called for the South Korean side to make all-out efforts to rescue the crew. The rescued seafarers have suffered minor wounds and are in stable condition. According to South Korea’s coast guard the ship CHENGLU15 departed from Pyeongtaek Port of South Korea’s west coast on 2 October and arrived at Pohang after two day in order to unload her cargo. The initial schedule was to leave for Japan yesterday after unloading all the cargo, but due to the bad weather the decisions was taken to stay in Pohang harbor. Yesterday at 1515 hours local time, the crew of the ship called the local police to report that the ship ran into the seawall as its anchor was swept away by the storm. The ship was carrying about 130 tons of bunker oil and diesel fuel. Unfortunately the South Korean coast guard, due to the heavy weather that was prevailing in the area, was able to get to the ship at 1700 hours local time. 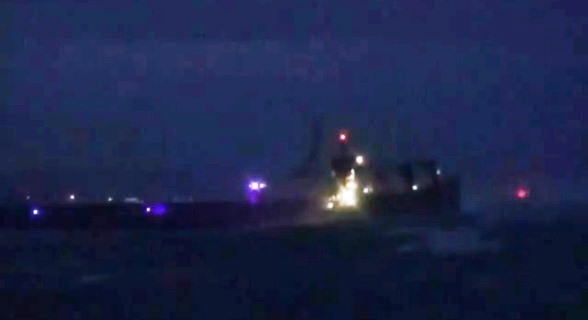 The ship sank after six hours in Yingri Harbor of Pohang.